Having a professional website is vital for any business, but particularly a local business. Most Google searches for services and products have a big local component. Internet users expect you to have a website that informs them about your location, products and services, and core values. Quite simply, you will lose out in your market if you don’t have a website that appears in local web search results. Before you choose a professional website template for your business, you must first consider your primary objectives for being online. Ask yourself: “Is this an eCommerce website?,” “Do I need to have detailed maps on my site?,” and “Do I need to add large images, such as a lunch menu?” By outlining your main objectives, it will be easier to select a template that meets your needs. If you are selling products, for instance, a template that supports eCommerce and allows you to upload lots of product thumbnail images is absolutely necessary. Professional web templates have all types of colors, patterned backgrounds, and text fonts. 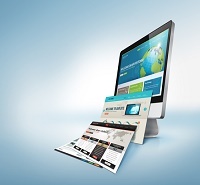 Consider your company branding when you select a business website template. Choose a template that has similar colors to your printed materials and logo. Also take the general theme into account. An irreverent T-shirt company may need a different template than a fine dining restaurant, for instance. While the T-shirt company might choose a template with vibrant colors and a paint-splattered backdrop, the restaurant would seek a template with deep colors and contemporary lines. As a business owner, affording a way for customers or clients to contact you is the lifeblood of your success. Look for templates that have modules for contact forms, so that people who stumble upon your website can quickly send a written message. The public will want to ask questions, offer suggestions, and comment on your products and services. You don’t want them to get frustrated about how to get in touch. You should also have a template that displays your phone number clearly on all screens. This is especially important to meet the demands of mobile searchers, who will want to use their device’s click-to-call function to swiftly reach you by phone. Choosing the right professional website design for your business sets the stage for a successful site. A streamlined, visually engaging template will not only keep visitors interested but also allow your business to gain credibility. People will be judging your company and brand by its website, so make your site a good one and create a positive user experience. Would you like more information about setting up professional business website templates? Check out these tips for using small business website builders.